When we moved into our house eight years ago, the front area was pretty much a barren gravel driveway and parking lot; south-facing, so, in summer a very hot, desert-like space too. However, it was the perfect spot for a garden. I was aware, but didn't dwell on the fact, that we live in lawn country, where the occasional vegetable garden (some fine ones too) are kept to the back yard. 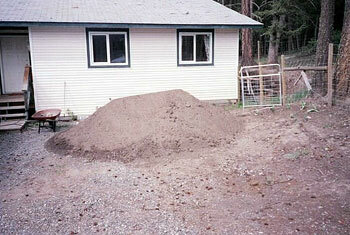 So, I ordered twelve yards of topsoil and had it dumped on the gravel in front of the house. Lo and behold - a new look and even a new micro-climate in front of our house. The desert has become temperate. From a neighbourhood PR standpoint I think I had it pretty easy. It would take a very churlish neighbour to claim that replacing the barrenness with a vegetable garden like this was bringing the neighbourhood down. 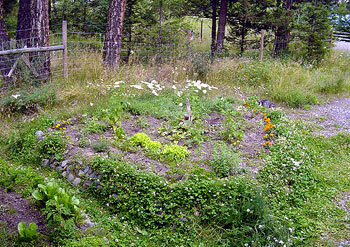 A real challenge - and a more common setup - is replacing a nice green lawn with a vegetable garden. Some are starting to take that one on. With growing awareness of what is termed "food security" (essentially, working on making local areas more self-sufficient in their food supply) home vegetable gardens are coming back into the picture. Most of the work in this area has been in replacing lawns with wild perennials and self-seeding annuals. Vegetable gardening is a more challenging step and, of course, involves more care - and more rewards too. I softened the impact by planting flowers around the edge facing the road. The vegetables liked them too. e.g. marigolds deter pests. Let this become a cool trend. It's made the New York Times, so some ground work (sic) has been done for us. The Family Farm in My Front Yard (MP3) - written and sung by Jean Elliott Manning. I stumbled across your blog while I was doing some online research. I am absolutely amazed at what you accomplished, turning a barren patch of land into such a lush paradise! Each step of the process seemed pretty ordinary and common sense but, taking a step back, I can see (and enjoy) the transformation. It used to be unpleasant out there on a hot summer day. I took a look at your blog and was impressed: it looks very comprehensive. Wow! 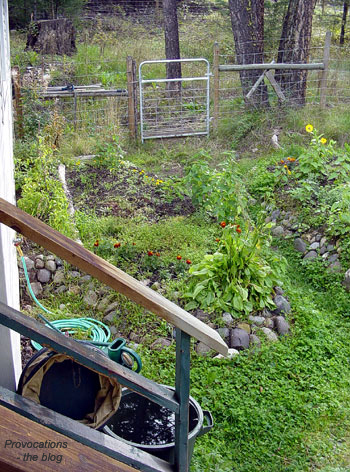 I found your blog while googling "front yard vegetable gardens" and I am inspired! I am looking to convert my (dead) grass front lawn into a veggie garden in the spring. The backyard doesn't get any sun, so if I really want veggies, it has to be the front. And with the low annual precipitation Colorado receives, lawns just don't make sense. Glad to know my little garden inspired you. Come back and let us know how you do. I too just googled "front yard vegetable gardens" and found your blog. I am inspired. I'm not much of a green thumb, but am determined to try. We just moved into our new house and there is barely any area to garden in the back yard. The front yard is a patchy mix of flowers and barren spots. At this point, I can't figure out what are flowers and what are weeds. There is also a beautiful lemon tree that is just now getting lemons. And being in California, where rain is not always guaranteed, I would feel better watering my dinner then my decorations. And really, growing vegetables are such a pretty sight. I love going to the local farms...now maybe I will have my own mini one. Thanks for dropping by. Keep an eye on things in your new home - what's growing, I mean. The Permaculture folks recommend doing nothing in the first year - just watch and see what's there and why. It's not easy or practical on a landscaped suburban lot, but I still heartily recommend going slowly until you see what comes up of its own accord. With water in such short supply, the things that come up on their own usually know how to take care of themselves. With the vegetable garden: lots of mulch. Please feel free to drop by here and let us know how you're doing. I've been searching around for gardening blogs in the Cariboo Chilcotin and came across this post. I lived in 108 Mile until I was 8 years old. It has changed so much since the late 70's/early 80's. I can't believe how many houses are there now, on forested land I remember playing in. Our house was a short walk from the beach and I thought living there was heaven! Our family is working on gradually growing more food in our yard, as well as taking over some of the lawn space with drought tolerant and native plants. We've only had one gardening season so far and there's lots of work to be done! This whole area (the South Cariboo) has had a major influx of people and the development that comes with that. It's surprising how many still think that their first "duty" is to strip the land of any natural vegetation and replace it with lawn. I wish you well in the season to come.